The Colorverse Multiverse Fountain Pen Ink comes in a 2 pack with a large 65ml bottle and a smaller 15ml bottle of a complimentary color. Many of the complimentary colors feature ink characteristics such as glistening. 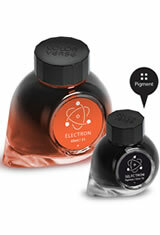 The Colorverse Multiverse(65ml + 15ml) Fountain Pen Ink usually ships within 1 business day unless otherwise specified. Each Colorverse Multiverse(65ml + 15ml) Fountain Pen Ink we sell is guaranteed to be genuine, authentic and will arrive brand new & unused! I was first drawn to Colorverse because of their large variety of colors and space/science themed seasons. After trying several of the Multiverse (season 3), Colorverse quickly became my favorite ink company! One thing I partially like in Season 3 (as opposed to season 1 and 2) is that you get two different colors in each box. Colorverse also does a great job of including a pen stand and book mark, among other goodies, in each box. Colorverse makes high quality ink that writes exceptionally well, provides vivid color, and charismatic marketing that creates an wonderful overall experience. These are some of my top favorite inks! String and brane are my absolute favorite with gorgeous shading. Love their packaging and innovative pairing. Inspirational! This review is for the Season 3 Multiverse "Matter / Anti-Matter" set. The inks are fast becoming my new favorites in this color area. I purchased this set because I was looking for a neutral-color ink, and this seemed to cover that need nicely. Matter leans slightly browner/warmer-toned, while Anti-matter leans slightly greyer/cooler-toned. While I think the two sizes of bottles are cool and make this brand stand out, I wish the quantities of each ink were more evenly distributed, because I like both colors.